I only ever saw one of these at a Chucky Cheese, in the 80s. What I great game that had lost of play time for the teenager that never had enough quarters. I went to Lots to get a hold of this one so keep reading! Manufactured by Bally Midway, Domino Man holds a copyright of 1983. You control a little guy who runs around the screen stacking up dominos to pre-set 'dots' that form a line or a shape. Random people walk around an attempt to knock over the entire line of dominoes and there is a bee that hunts you down. A level is completed when you string the entire line of dominos and knock them down. In addition to pictures of dominoes around the monitor, the lower front portion of the cabinet (around the coin door) sports several large vacu-molded plastic dominoes. Well in the first year I started collecting, the hunt began. None at the auctions, but then I spotted it on the RGVAC newsgroup. One Domino Man working in nice shape. I emailed the seller immediately and was sending my cash by the end of the week. Once again, putting the extra money up front, makes for an easy restoration. The worst part of the whole machine was the terrible monitor burn in. I opted for a Welles Gardner monitor to replace it with. 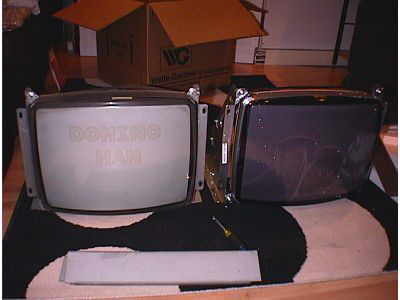 As you can see from the side-by-side picture, the amount of burn that was in the tube, driving the monitor replacement! Replaced some bulbs, re-keyed the door locks and put in the Basement Arcade! number of dominos and does not appear anywhere else in the poems. 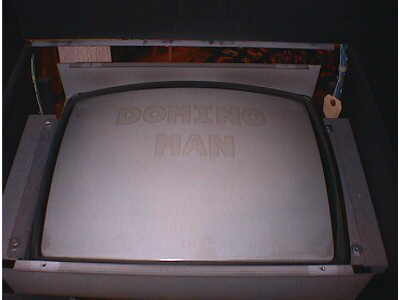 Do you have a Domino Man arcade game and need some of it's technical information? Visit the library for the full manual. Click Here for the wiring Pinouts. Having sound problems? Click Here for some MCR troubleshooting!